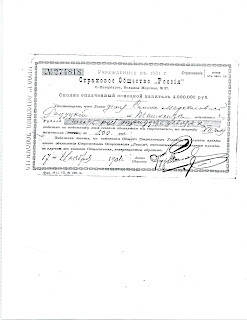 A blog about the search for the Woskobojnik/Levine, Sorkin, Berstein, and Fine families from Derazhne, Ukraine, and the Batkin, Smith and Cohn families from Vilna, Lithuania. Samuel Rain is the husband of Rebecca Levine Rain, my great-aunt. But I can't find Samuel and family coming to America. I searched the passenger lists. 3 census indicate they all came in 1904. The Intention, Declaration and Naturalization documents show his name as Samuel Rain, the ship name, the year he came, the ship line, the departure and arrival cities - how hard could it be to find him? Well, really hard! Sam and Rebecca had 9 children, and it took awhile to find a descendant who may hold the key. After several phone calls, it was determined that "Rain" was not the original name. It was somewhere, someone would have to find it. It might be Regn - the Yiddish word for rain - that didn't work. Roitman, Rein, Rhein, Rohklin, Rudensky - where to begin? Going back to the Lynn, MA directories for 1904 through 1906 I found a Frank Rain and a Joseph Rain. All living relatively close to each other. All tailors, all coming from the same region in present day Ukraine; Derazhne, Rovno, Wolyn. Looking for the descendants for Frank and Joseph I found a grandson who confirmed that his grandfather's father's name was Mordechai Markel, which happened to be the same father's name on Sam's tombstone. So, now we have brothers. Not long after checking over death certificates, Joseph Rain had the same father as well. Now we have 3 brothers. But, what was their name in the "old country"? Through some digging, emails and a moderate dose of pleading, a miraculous treasure trove of documents came my way. 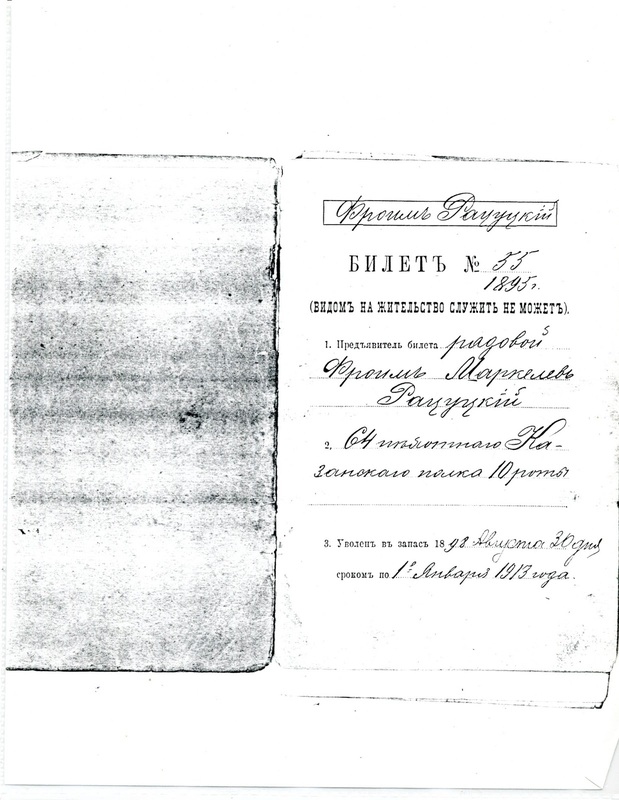 Documents in Russian and some in Ukrainian, indicating that Frank Rain was none other than Froim Mordechai Razyzkij. 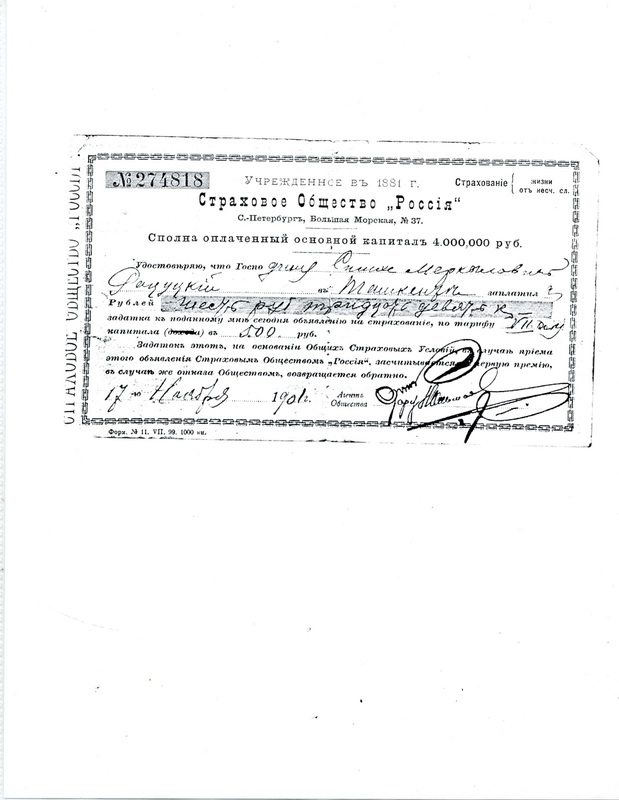 A friend's father was able to discern the name from the documents. 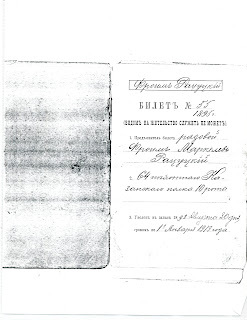 Someone else determined that one of the documents was an insurance policy purchased for 6 rubles to pay out 100 rubles in the case Froim was injured or killed in the Russian army (or possibly the Navy) there was some discussion about that). The other document was a medical discharge paper. Did Frank collect the $ 100 rubles and use it to get to America? Time will tell. The next step is to get the documents fully translated, and then go see if I can find the "Razyzkij boys". Visiting my local Family History Center I was able to find the 1904 passenger lists for the S.S. Potsdam, leaving Rotterdam, Holland 1904. But Frank's documents have a correction on the arrival, was it 15th Sept. 1904 or 8th Aug. 1904? When I searched the first date I couldn't find a Razyzkij. Another trip and additional digging will hopefully uncover his arrival. 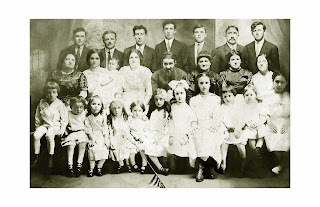 Frank arrived in 1904, by 1912 he and his wife's family gathered for a group photo. Frank is 2nd from the right, last row, his wife Jennie is in front of him. Their 4 children are 7 from the left in the big bow, Laura, 9, from left Abraham, Jacob and Elizabeth. Having Frank's name will hopefully help me find Sam and Rebecca, and Joseph's arrival. Sometimes to get where you are going you end up taking a different path. It started with a curiosity of where my grandparents were from. Sometimes it was Poland, other times Russia and most often there were never any details. With an opportunity to live in the Washington D.C. area, and access to the National Archives, I spent many a day searching through microfilm to look for my grandmother's information. Not realizing until 20+ years later she had a different surname. Once that piece of information surfaced all kinds of information flowed. And so the journey continues. © 2017 - PathFinderFamily,Dorie Cohn. Watermark theme. Powered by Blogger.